Google backs out of Pentagon cloud contract after workers protest…20,000 Googlers walk-out to protest sexual harassment and workplace discrimination….Microsoft workers protest use of Halolens by US Army…Googlers protests AI board..Google closes AI board..Microsoft workers stand-up for Chinese tech workers….Googlers claim retaliation for walkout…. On and on over the last 18 months we’ve seen headlines and stories like this, stories about political advocacy at what are technically -and legally- private workplaces, but which, in reality, function differently. We see these stories on our screens, and we read about the workers and their workplaces, but what are all these stories really about? Are we seeing the birth of a proto-labor movement, or is this something else? Why did I feel support & solidarity with Googlers walking out following sexual harassment at their workplace, while secretly resenting their ability to organize & protest? These are workplaces where all the familiar trappings of American workplaces are present. Por ejemplo, if a Google workplace is in California, I’m 100% certain there’s a “Your rights & responsibilities” placard in the facility that’s meant to inform workers of their rights. There’s likely OSHA placards too. Information about worker’s comp. Minimum wage notices. Exit signage. Fire & building regulations. There’s probably compliance hotlines for employees to dime on bad or unethical behavior they see at their employer. All the legal trappings and rights that labor won for us politically in the 20th century, all those things are at Google, at Microsoft, at Amazon, just like they are at your workplace & my workplace, no matter how big or small it is. And yet, step back, and these tech workers enjoy much more liberty -indeed, are entitled to more rights- at their workplaces than we are at our’s. So much liberty, in fact, they can be themselves on our screens. During work hours even. Rarely do they have to say, “Thoughts & Opinions expressed here are mine nad mine alone and do not represent those of my employer, ” like I have to say. They can even show off the gifts they’ve received on social media -no need to disclose how or why they are receiving compensation from other companies- they can just show it off. They are evidently entitled to so many rights within their workplaces, they can even criticize their superiors in public, by name. Wild! Meanwhile, the rest of us don’t have that power. We’d be fired *instantly* if we did a 10th of what the tech workers do. This then, is their entitlement, their privilege. They are entitled to lobby and organize and effect political change at their workplace -which intersects with our workplaces & homes by virtue of the internet and our screens- during work hours, while we cannot do the same at our’s. What explains that and what are their goals? Well, their entitlement to rights we don’t have springs from their ability to code a world -a frontier- that achieves returns in an effecient manner for the shareholders. They are, in effect, hired guns building out a frontier that ultimately will deliver a reliable annuity to their sponsors, the bank*. Let’s take a look at this chart I made in Excel to understand how this works. Particularly pay attention to the revenue per employee number & market cap/employee. Those numbers are the Rosetta Stone for divining the political power of these tech workers, and indeed, the economic model that SiliconValley itself uses in its conquest of the world, and of the 20th Century’s verticals. Notice that, for instance, every Google employee generates almost $1.4 million worth of revenue for the company. A Costco employee, on the other hand, generates only about half that much. Notice too that the Googler’s share of market cap (this chart was done on 2017 numbers but generally is accurate) is almost $9 million, 18x that of the Costco employee’s share of that corporation’s market cap. Apple’s revenue/employee figure is off the charts too. Nearly $2m of revenue is generated by each Apple employee**. Microsoft & Amazon’s are more modest -particularly Amazon’s due to the larger number of people they employ- but even they are able to protest and organize politically at their workplaces, though their employees seem to make fewer waves as compared to Google’s. Facebook employees, in contrast, are the great outlier. What little we hear from inside Facebook comes from ex-employees. The firm, like Apple, seems to have a stronger management culture than Google, but a less politically aware one. But notice that Facebook -whose revenue per employee numbers are very high- outsources the dirty work of managing its frontier to third parties like Accenture. We recently heard from Accenture employees about the work they do on the Facebook frontier. It was not a happy story. Now look at Walmart: Walmart employs almost 3 million people yet its revenue per employee is the lowest of the bunch, as is its market cap/employee figure. How often do we hear from Walmart employees? Notice, this is very much a political agenda. These -apart from harassment & discrimination- are not things most people working in most workplaces expect or demand to have a say in. I certainly don’t at my work place. We use our government for that. We got to the polls for that. We pester our representatives in government to write laws for this kind of stuff. But on the frontier, there is no government and there is no law. Notice too that these employees’ demands are not material. That is to say, they aren’t about compensation, a shorter work week, more time off, or a greater share of revenue. They are not about the relationship of the employee with the employer, largely. They are more about product development, about the next stage of the conquest of the frontier. Notice too that these employees are free to leave the employ of their workplaces, just like you and I are. But they aren’t. And notice that largely, these employees are looking out for their own cohorts’ interests in the development of those products. Not your’s necessarily, nor mine necessarily. And unlike my workplace, or your workplace, the work these employees do at their workplace intersects and impacts us at our homes and work. Daily. Globally. Their work impacts you and me, and our loved ones, and people as far away as Myanmar, South Africa, and New Zealand. Mostly, I like their agenda. But it’s inherently a non-democratic agenda because I have no say in how the products are being developed. It’s an agenda that includes some laudable aims & goals -especially as it pertains to empowering marginalized groups- but it’s still an agenda that’s predicated upon their employers & sponsors conquering what little remains of Hannah Arendt’s ‘public’ and all the institutions thereof. It’s an agenda not necessarily at odds with Zuboff’s surveillance capitalism, so long as their cohorts are protected -favored even- on the frontier. And I’m not sure I’m okay with that. 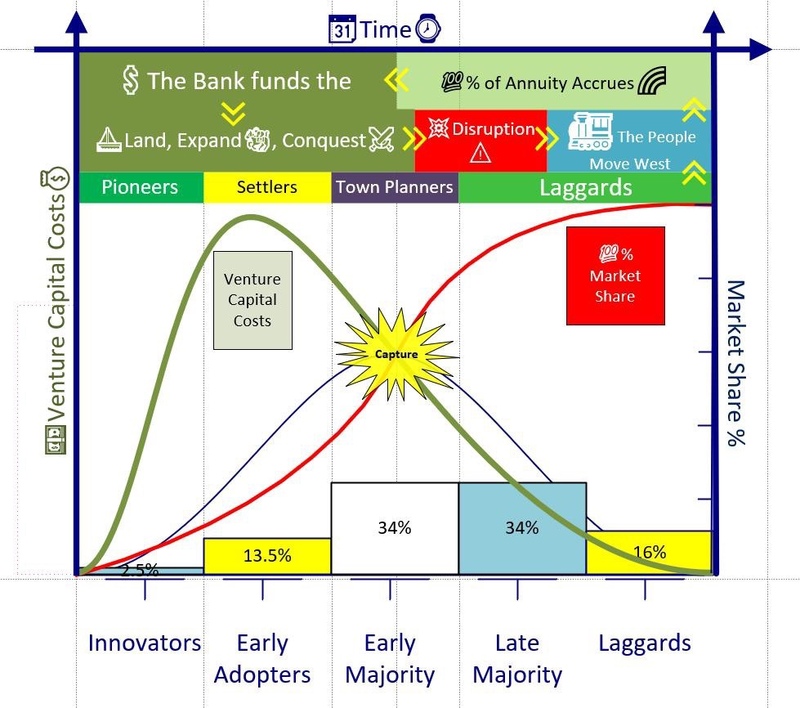 *I call this arrangement Capitaltech, and you can see how it works here, in this chart which I made in Visio, based largely off Everett Rogers’ Theory of Diffusion of Innovation with some bits added on from Wardley & Brechin. It’s about 1040am. I’m in view of a TV. Rahm Emmanuel is on the TV talking about Prosecutorial Discretion and Smollet Case. I try to remember what the Smollet case was about; oh right…a popular gay male black actor allegedly gets roughed up by MAGA thugs. Only later, amid the outcry from the left against the right, the CPD arrests Smollet and accuses him of staging the whole thing, of hiring the thugs who beat him up. The Right cheers and for four days owns the screens we all look at. And so there I was at 1040am and I’m watching Emmanuel tell the people of the Windy City why the DA’s decision is bad and wrong, an outrage. I wonder which cohort he’s speaking to more; but give up because the inter-sectional deception of the story playing out before me blurs the once clear Venn Diagram in my head. Which may be a Good Thing, I grant you. A confusing thing, but a Good Thing because it challenges me to noodle harder, and it is by noodling through the difficult affairs of the public that I learn & move forward. So I study the faces of the assembled officials and mute Emmanuel’s confusing words in my mind. I look at the CPD chief who is wide-eyed and looks terrified. It’s the first time I’ve seen his face though; I could be wrong, but that’s my read of his body language. That’s ok. I’m scared too. The Beltway Expert Pundits call what I’m seeing on my screen the “nationalization of our politics” which, I reckon, is pretty accurate, and moreover is probably a great thing for those whom haven’t had as much power as I have had in the public places of our society. So I’m happy for them because it’s helped me meet lots of folks I’d never have met before, to read them, to learn from them, to take their politics and add them to mine, if they’ll let me. It’s scary because the Finance Engineers & the Software Engineers are working together now and they own the screens, which is effectively like owning the media. So they control what we see. In effect, they’ve captured our politics too. Worse yet, the screens are two way. There’s interaction. It’s no longer just me looking at the CPD Chief, there’s a wizard in between my eyes & the CPD chief, and the wizard is counting my likes, discerning my intent, measuring my engagement, and plotting A/B tests on me. And it’s scary because the nationalization & capture of our politics happens locally in our homes & communities, the places we don’t talk much about anymore since we’re all looking at Chicago right now. So it’s all a bit confusing, but like I said, there’s light in the screen, and it’s you and your politics, you and your openness to advocating for yourself and your loved ones. But then, as I’m walking away from the screen, the alert sounds. That hated dreadful alert. That signal of doom. The sound made just before the Sword of Damocles falls. The thing that’s frightened me since childhood that occasionally wakes me up in a cold sweat.